It may only be the middle of March, and you’re likely still digging out from the latest Nor’easter that stormed through Massachusetts, but before you know it, you’ll need to turn on your air conditioner in order to keep your home cool and comfortable. At Lamco Systems, we can provide AC service and repair when you need it most, and in this post, we’ll look at some ways that you can protect your air conditioning unit from damage throughout the year. You’ve spent a lot of time making your yard look perfect and pristine, and everything from the well-manicured grass to the symmetrical shrubs add to the appeal. 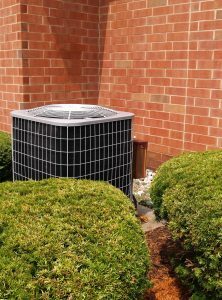 However, if there are grass or shrubs growing close to the AC unit, make sure you take the time to trim them back every so often. Greenery that’s growing too close to the unit can block the airflow that your AC needs to operate properly, and any insects that like your grass and shrubs could find their way into the unit. If you’re planting new grass or installing new shrubs, make sure you leave plenty of clearance around your AC unit. If there is a tree branch growing over the unit, it can be a good idea to trim it so that leaves don’t fall into the uncovered unit during autumn. If you’re worried about the branch breaking and falling on the unit, cut the branch back to the trunk. Hiring a professional tree company can often be the best way to ensure branches don’t pose a risk to your air conditioner. You may not think too much about your dog relieving itself on the AC unit, but the truth of the matter is that the urine could be causing extensive damage to the unit. Dog urine can be very corrosive, and it can damage the AC unit’s fins and coils that are made of aluminum and copper. Putting up a short fence or enclosure around the unit can protect it from your dog, as well as from sticks and rocks that you may hit while mowing the grass. If you install a fence around your air conditioner, make sure there is plenty of clearance around the unit for proper air flow. When done properly, the fence will protect the unit from damage, and also block the unit from view if it’s visible from the street. 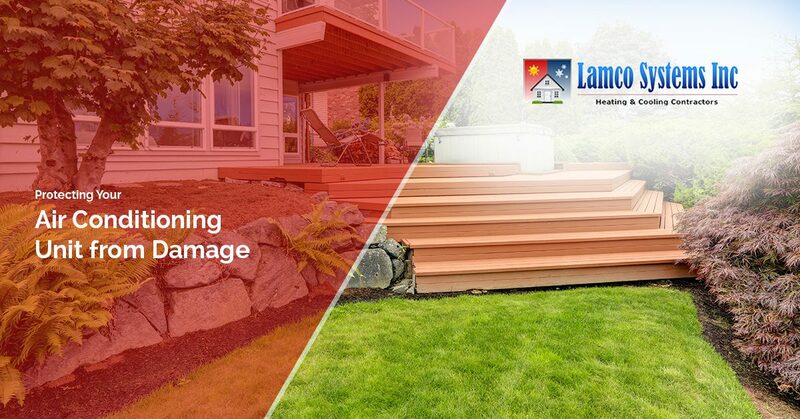 If you have questions about how best to protect your air conditioning unit, then contact Lamco today. We’re proud to serve all of Merrimack Valley, so when you need AC service or repair, we’ll be there to take care of the problem. If a branch has fallen on the unit, or something has become jammed in the fan or the coils, we’ll provide a solution as quickly as we can. Contact us by using the form below, or by calling us at (976) 674-8837. We offer 24-hour emergency service, so if your AC quits in the middle of a warm night, we’ll be there as soon as we can.